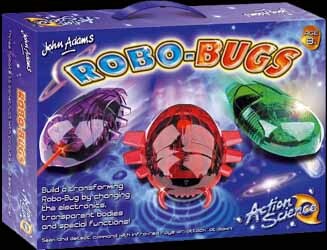 The Action Science Robo-Bugs kit includes everything you need to create three robotic bugs, each of which explore a different area of technology to help you learn and understand how electronics work. The three robots you can construct are the "Guide Robot" which seeks and detects objects; the "Wake Me Robot" which is light-sensitive, lurking in the darkness ready to spring into action at dawn (or whenever you switch on the light! ); and the "Remote Control Robot" which can be operated by any TV remote control. The instructions are easy to follow (it's much simpler than putting together an IKEA wardrobe) and there is a certain amount of achievement to be had out of building these robots and learning, on a simple level, how the technology works. And, as with John Adams's other impressive electronics kit the Hot Wires set, it will give young minds an entry into the world of electronics - and hopefully whet their appetite to movie on to some of the other, more intricate kits that are available once they mature. Yet another fantastic electronics kit from John Adams.